The greatest master of horror in the silent era was a cheerful man, much loved by his collaborators, even though they might lose consciousness from time to time while enveloped in clouds of steam or surrounded by tongues of flame. F.W. Murnau (1888-1931) made two of the greatest films of the supernatural, "Nosferatu" (1922) and "Faust" (1926), both voted among the best horror films of all time on the Internet Movie Database: "Faust" surprisingly in fourth place, just ahead of "The Shining," "Jaws" and "Alien." Murnau had a bold visual imagination, distinctive even during the era of German Expressionism with its skewed perspectives and twisted rooms and stairs. He painted with light and shadow, sometimes complaining to his loyal cameraman, Carl Hoffmann, that he could see too much -- that all should be obscured except the focus of a scene. "Faust," with its supernatural vistas of heaven and hell, is particularly distinctive in the way it uses the whole canvas. Consider the startling early shot of Mephisto, his dark wings obscuring the sky as he hovers above a little village that huddles in the lower right corner. Murnau treated the screen as if it offered a larger space than his contemporaries imagined; long before deep focus, he was creating double-exposures like shots in "Faust" where a crowd of villagers in the foreground is echoed by faraway crowds in the upper corners. His screen encompassed great breadth and depth, so that when Mephisto takes Faust on a flight through the sky, we really do seem to see the earth unreeling beneath them: towns and farms, mountains and rivers. Murnau used a model of the landscape, of course; as his art director, Robert Herlth, remembered, "there were pines and larches made of reeds and rushes, glass-wool clouds, cascades, fields of real turf carefully stuck on plaster. When Murnau saw us at work, he bent his great height to help us make our little rocks and trees." Like all silent-film directors, Murnau was comfortable with special effects that were obviously artificial. The town beneath the wings of the dark angel is clearly a model, and when characters climb a steep street, there is no attempt to make the sharply angled buildings and rooflines behind them seem real. Such effects, paradoxically, can be more effective than more realistic ones; I sometimes feel, in this age of expert CGI, that I am being shown too much -- that technique is pushing aside artistry and imagination. The world of "Faust" is never intended to define a physical universe, but is a landscape of nightmares. When the elderly Faust is magically converted by Mephisto into a young man, there is a slight awkwardness in the way one image is replaced by another, and oddly enough that's creepier and more striking than a smooth modern morph. Murnau and his contemporaries were inventing their techniques while they were using them. Herlth recalled that while Murnau was filming an opening scene of an archangel enveloped by clouds, the director "was so caught up in the pleasure of doing it that he forgot all about time. The steam had to keep on billowing through the beams of light until the archangel -- Werner Fuetterer -- was so exhausted he could no longer lift his sword. When Murnau realized what had happened, he shook his head and laughed at himself, then gave everyone a break." Yes, but he was entranced again in the scene where Camilla Horn, playing the beautiful Gretchen, "had to spend hours tied to the stake, with flames leaping round her from 20 lykopodium burners. When she fainted, she was not acting." And the famous Emil Jannings, who played the doorman in Murnau's "Last Laugh" and is Mephisto here, stood for hours above three powerful fans which blew clouds of soot to make his cloak billow 12 feet above his head. All of these facts I take from the bookMurnau,by the invaluable critic Lotte Eisner, who never met Murnau but talked to his collaborators after his death in 1931, at 43, in a traffic accident. 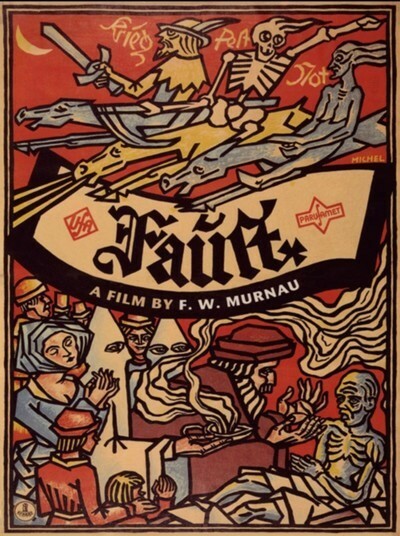 "Faust," the story of a man who sells his soul to the devil, was long a European legend before Goethe spent 50 years writing a two-volume version of the myth. Because Goethe was beloved by the Germans, some audiences for Murnau's film were outraged by the liberties he took with the story, not least in shaky central episodes where Faust falls in love with Gretchen, demands to be made young again, and then woos her while Mephisto distracts her Aunt Marthe with his own romantic designs. Somehow it diminishes Mephisto to assign him carnal desires -- particularly since, as an angel, he presumably lacked all inclination and equipment for such pursuits. The film's greatness resides in its majestic opening scenes and its horrifying conclusion. Most viewers dislike the courtship between Gretchen and young Faust, although it is essential to set up her eventual fate -- an ending so bleak that there is not much consolation when the archangel informs Mephisto that "Love" is stronger than all the powers of darkness. Tell that to Gretchen, burning at the stake, and Faust, transformed back into an old man and throwing himself into the flames at her feet to beg forgiveness. Some of the early scenes remind us of "Nosferatu" in their evocation of a terrified population. Faust (played young and old by Gosta Ekman) is seen as a bearded scholar, surrounded by his books, until the plague strikes the land. From his window, he sees hooded figures carrying corpses to a charnel-pit; he is called to the bedside of a dying woman, but all of his wisdom and art are helpless to save her, and after praying to God, he is tempted to invoke Mephisto. There is true horror as he burns his books and stands within a ring of fire to call down the devil; when he finds he has the power to cure dying villagers, he thinks he has made a good bargain, but soon his power intoxicates him. Mephisto offers him the beautiful Duchess of Parma; he prefers the sweet and innocent Gretchen, and demands the gift of youth so that he can woo her. That way tragedy lies. Mephisto is crafty in his techniques; at first he offers Faust a 24-hour trial of satanic powers, no strings attached, but soon Faust is ready to sign anything to win poor Gretchen. So much for the plague victims. Silent films like this deal more in broad concepts than in the subtleties of personality. Like Greek myth and comic books, they present characters clearly defined by their strengths and weaknesses. There's no small talk. Ekman creates an elderly Faust in anguish over his inability to cure plague victims and too proud to admit defeat. The young Faust is led astray by the stirrings in his loins, and the function of Gretchen, I am afraid, is to be the innocent victim of his lust; she wanders through a blizzard with her innocent infant and burns at the stake, all because of her love for the unworthy Faust. It's worth mentioning that William Dieterle, who plays Gretchen's brother Valentin, fled Hitler, came to Hollywood and had a long career as a director, distinguished by "The Devil and Daniel Webster" (1941), itself a version of the Faust legend. Murnau died before he was able to express himself fully in the sound era, where there is no telling what he might have accomplished; soon after he moved to America, his "Sunrise" (1927) shared the first Academy Award for best picture. In death, he is surrounded by legend, not least in E. Elias Merhige's strange film "Shadow of the Vampire" (2000), where John Malkovich plays the director as a man whose star, Max Schreck (Willem Dafoe), is in fact a vampire. Murnau promises Schreck that he can eat the leading lady as his payment, but the vampire grows hungry and devours the cinematographer, and in desperation, Murnau muses, "I do not think we need the writer." The movie is not, by the way, a comedy, but feeds on the real horror that Murnau created. He was an original, and no one else ever made films that looked like his. They are strange and haunted; you reflect that if such satanic dealings were possible, they would probably look very much like this. Great Movie reviews of "Sunrise" and both the Murnau and Herzog versions of "Nosferatu" are online atrogerbert.com.